Lets Play Big has relocated to Washington and are now a role play centre. Read about our visit here. The messy play centre is Hebburn is no longer open! 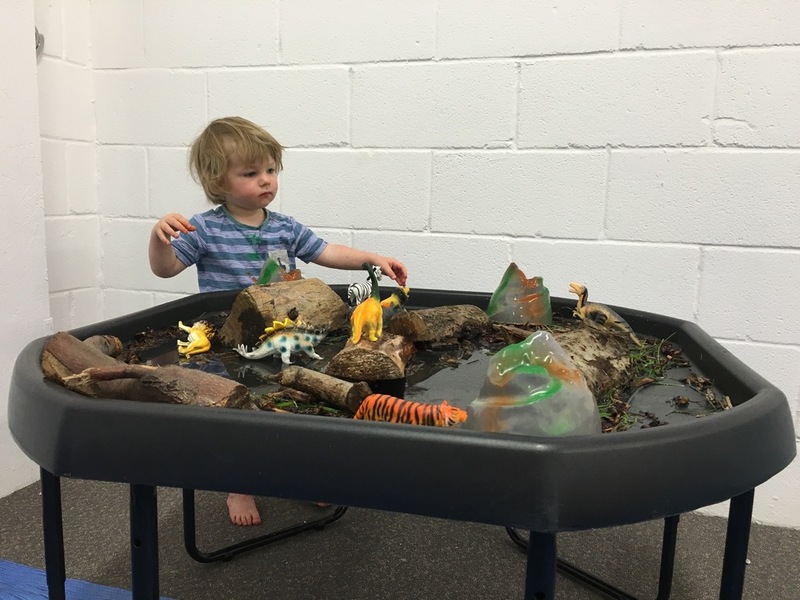 Unlike most of the messy play classes that I know of, which operate from community centres or hired rooms, Lets Play Big is based within it's own unit in an industrial estate. It is open 7 days a week, running four sessions a day which makes it perfect for working families. Before I started my current maternity leave, I worked four days a week, and I remember searching online for classes that I could take my toddler to on my day off, and frequently being disappointed when something looked really good, but was only available on a Monday at 10am for example, when I was working. It is even better for people who work five days a week, because as far as I know, whilst some classes are branching out into putting on the odd Saturday morning, there isn't anywhere else nearby where they offer this amount of pre-school classes over holiday time and weekends. They have different themes every week, and from looking at their facebook page the activities and stations completely change as per the theme. I've included loads of photos in this blog, as I think it's much easier to picture what you're paying your money for, but if you do go along you might get totally different play stations, although i'm sure it'll be just as good. Point to mention here - as with Role Play, it's a shoe-free environment so don't forget your socks if you are like me and have perpetually chipped nail polish on your toes. For pretty much the first time ever I was actually prepared and had a spare pair in my bag so wasn't shamed by my hobbit feet this time. I felt properly smug that I had them too, is this how it feels to be a responsible parent who actually plans for things? Maybe I should take my husband's advice and actually spend 5 minutes thinking about where I'm going when packing a bag to leave the house, as opposed to my usual style of running out the door grabbing handfuls of random clothes and packet foods to sit on my passenger seat in the car for weeks on end? Anyway enough about me - on to the photos. As it's based in an industrial estate there are plenty of car parking spaces right outside the door. The whole set up is based in the one room. 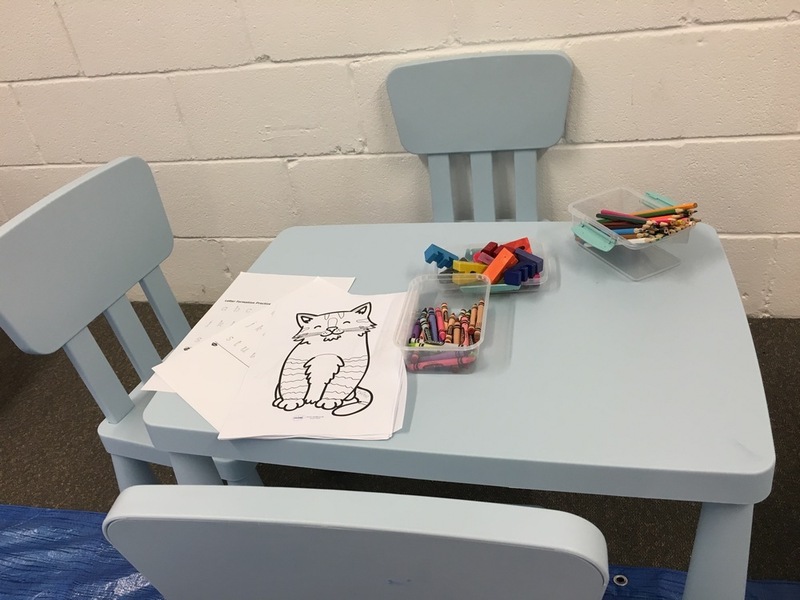 When you walk through the door there is a counter displaying cakes, and where you pay your entry fee, an area with footwells to store shoes and spare clothes, a few tall stool type seats, and the play space. I couldn't fit everything into one photo, but did take individual pictures of all of the play stations. The sessions aren't lead by staff, and are free play for kids to spend their time wherever they wanted. We visited with my friend and her two kids, as well as my two usual testers. Between us we had a four year old, 2 two year olds, and a 7 month old baby. We had the place to ourselves, so the kids didn't have to practice their sharing skills, but the place was so big, with such a variety of activities to play with that even at full capacity (currently 16 children for the group sessions but can be more for private parties) I don't think it would feel too cramped. Because the sessions are free play, we did have to guide the kids and show them all of the activities. So worthwhile wearing old clothes yourself if you are going. Obviously I turned up in a white top - perfect for carrying a baby who was basically bathed in jelly by the end of it. After having kids I have no shame though, and went shopping straight from Lets Play Big, in my heavily stained clothes. Cake Smash - The baby loved this one. 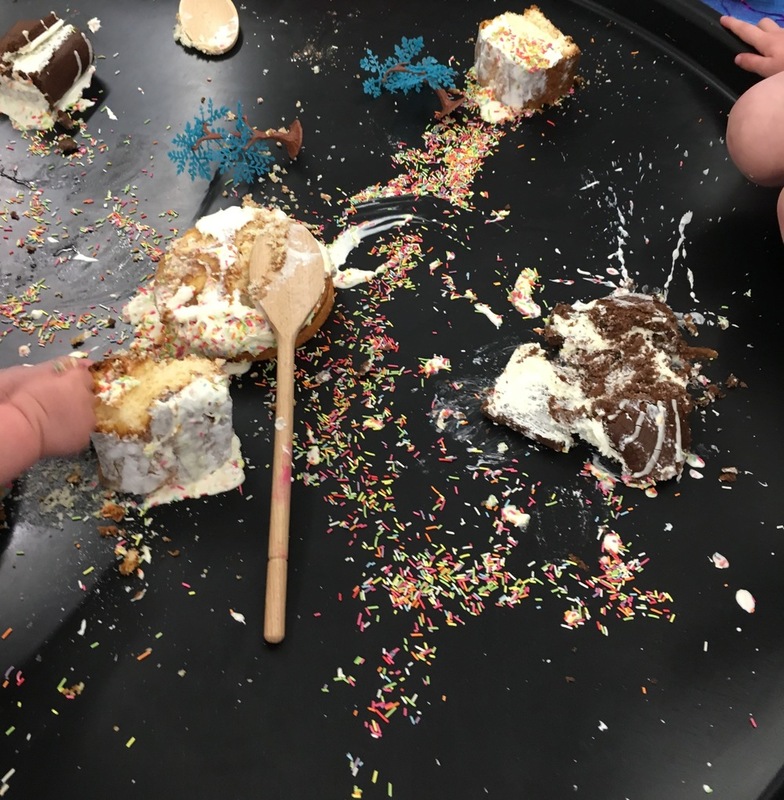 I was surprised that my toddler, with his sweet tooth didn't get more stuck in to eating the cake, but on this one occasion he must have had so much to play with that he forgot he usually has zero manners when it comes to cake. The kids were a bit timid with this station to start with. But after we showed them that they could use the baking utensils to smash up the cakes they definitely got on board. The baby was on board from the very beginning! Dinosaur Forest - I think this was my toddler's favourite station. Set up at waist height with water, branches, leaves, rocks and toy dinosaurs and animals, he played in this area for ages. I must try to recreate this at home in the garden using a sandpit or something similar. 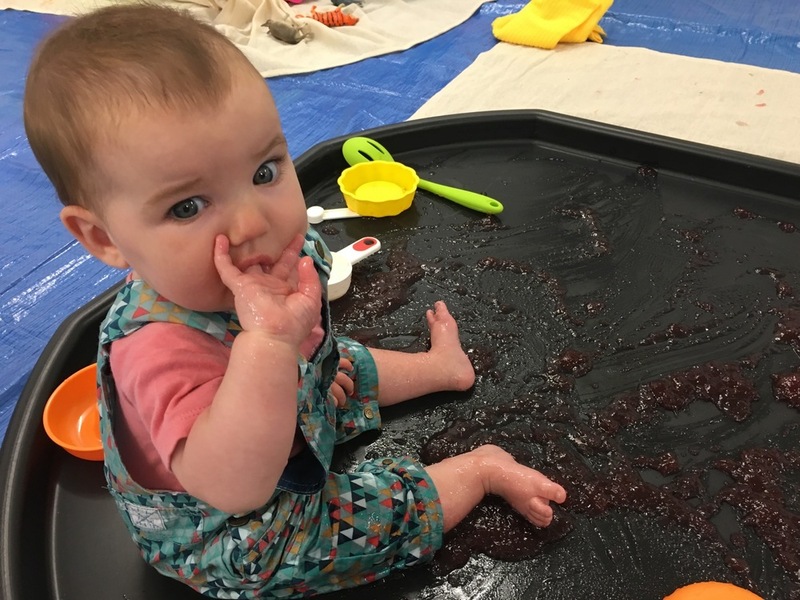 Jelly Play - another one that the baby loved, which makes me feel guilty for not taking her to the odd baby sensory class every once and a while. Lets Play Big is probably one of the few places where the baby seemed to get as much out of it as the toddler did. Another good thing about this place is that it saved me having to feed her once we left as she was so high on cake and jelly! Multicoloured rice - After snaffling her way through the other stations, we had to keep a close eye on the baby so that she didn't eat this too. But both her and my toddler liked throwing this around. Foil string - Fun to pick up and throw, and I liked the little pincers which were there for older kids to practice picking them up with. Arts and Crafts - There were loads of different arts and crafts for kids to move between, including plasticine which came with idea sheets about what to design, butterfly making using paper plates with examples to use as a template, paint to either dip your hands and feet in and paint the huge sheets of paper on the floor and walls or smaller areas where you could use items like the feet from the toy dinosaurs to print the paint on coloured sheets. I loved the baby hands and feet section, where they had supplied lovely thick card with a cute little poem about baby hands and feet along with the paint pads so you could take home painted handprints as a keepsake. The owners even laminated these for us. 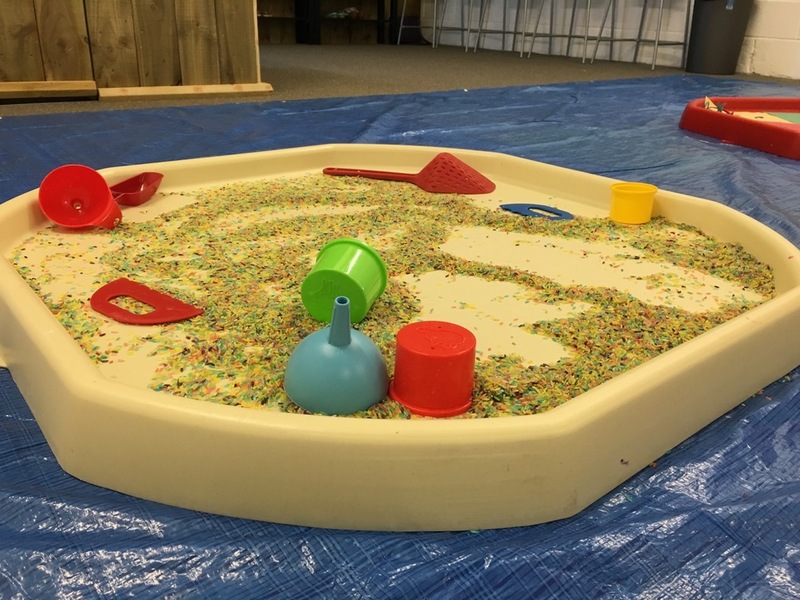 Sensory and Sand Play: Attached to the wall were holes where kids could put their hands in to feel the different textures of the items within them, there was also a sand bucket that my toddler loved. Clean up: There was some huge buckets of water and some towels to get cleaned up at the end of the session or to use when moving from one activity to the other. Had to intercept my toddler climbing into these more than once, as to him it was another play activity. 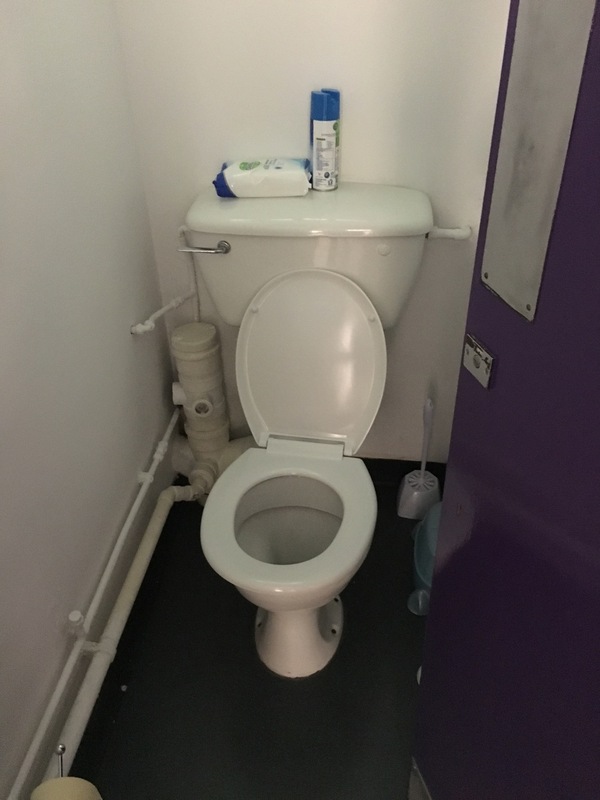 Toilets: There is only one toilet, and it's pretty small. I think it might be a struggle to fit a toddler in there with you if you needed the loo when you went. But if you were on your own with kids there, you could probably leave them in the first room with the sink and lock that door so they couldn't get up to any mischief whilst you were gone. That or you could ask the staff to look after them for the 30 seconds you were away (sometimes those rubbish pelvic floor muscles have their uses.) The changing table is in a corner of the main room, which means if you have two kids like me, you don't need to drag them both away from the fun to change a nappy. They had some wipes and nappy bags to use which I always think is so helpful in case you ever forget. Food and Drink - There are a range of cakes, and hot drinks available to buy, along with crisps, chocolates and cold drinks. They also sold pouches of baby food, which is a great idea, and it was only when I saw it here I realised how few cafes do that, or have them on show anyway so that I notice. We bought a coffee and a carton of juice, which was reasonably priced at £2.30 for both. My friend bought some cookies for the kids and a slice of cake which she said she enjoyed. Prices and Session Times: The idea is that you attend a 90 minute session, 60 minutes for playing, and then 30 minutes for getting cleaned up and having something to eat or drink from the cafe if you wish. It's cheaper to pre-book but you can just drop in. If you pre-book it is £5 for the first child (babies under 6 months are £1.50) and £3.75 for any siblings. Its an extra £1 for first child and siblings if you don't book in advance. Whilst it isn't cheap I do think it is worth it, all four of the kids we took had a brilliant time, and it's excellent for parents of more than one child, as with there being such a good variety it would keep the attention of a real range of ages. All of the equipment they were playing with was very good condition too. As I said at the start, I love that it's on over a weekend, and that there are so many sessions to choose from. Sessions each day are timed at 9:30, 11:30. 13:30 and 15:30 so can fit in with any other commitments you have. Actually booking a session gets a bit confusing though, with you having to pay a £2.50 deposit at the time of booking and then the rest when you arrive at Lets Play Big. The owners explained this was due to an issue with their booking system and that at some point they'd change to paying for the full session in advance. Check out their Facebook page for updates on that. What do you think of Lets Play Big? Have any suggestions about where I should take my toddler over the summer whilst our favourite playgroups are finished for the holidays? Then please leave us a comment. Disclosure Policy - We received complimentary entry to Lets Play Big in return for an honest review. Unsurprising all of the random blabber and chuntering on in this post is my own. See the about us section of this website for the full corporate speak disclosure policy.